Quantum electrodynamics was one of the first quantum approaches to a quantum field theory, so it introduced many features possessed by string theory (which is also a quantum field theory). In quantum electrodynamics, virtual particles can exist briefly, arising from the energy fluctuations of the quantum fields that exist at every point in space. Some virtual particles — such as the photon in the figure — exist just long enough to communicate information about a force. Other virtual particles spring into existence, seemingly for no purpose other than to make the lives of physicists more interesting. The existence of virtual particles is one of the strangest aspects of physics, but it’s a direct consequence of quantum physics. Virtual particles can exist because the uncertainty principle, in essence, allows them to carry a large fluctuation of energy, so long as they exist for only a brief period of time. 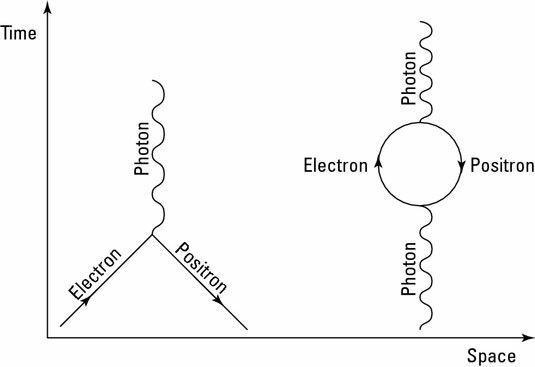 The right side of this figure shows a pair of virtual particles — this time an electron and a positron. 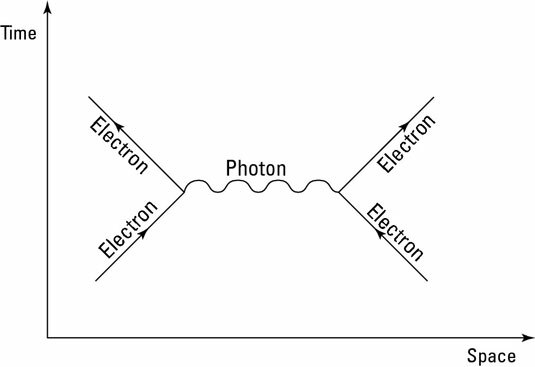 In some cases, a photon can actually split into an electron and positron and then recombine back into a photon. The problem is that even though these particles are virtual, their effects have to be taken into account when performing calculations about what takes place in a given area. So no matter what you’re doing, an infinite number of strange virtual particles are springing into and out of existence all around you, wreaking havoc with the smooth orderly calculations that you’d like to perform!